Working at Home: Who Claims the Home Office Deduction? Often cited as a “red flag” for audits, the home office deduction is in fact a legitimate business deduction with particular importance for certain careers and small business owners. Moreover – from the housing economics perspective – IRS data concerning the deduction, along with Census data reporting who works at home, can shed light on an important and growing role for homes: workplaces for business owners and telecommuters. There’s no doubt that the practice of working at home is on the rise. According to data from the Survey of Income and Program Participation, in 1997 7% of workers (9.2 million individuals) reported working at home at least one day a week. By 2010, that total had grown to 9.4% (13.4 million), an increase of more than four million or 35%. The geographic distribution of those workers who primarily work at home (most days) shows interesting geographic clustering. Using data from the 2012 Census Bureau American Community Survey, the map above charts the share of the workforce (age 16 and over) who report working at home. The highest shares are found in the West, the Northwest, the Upper Midwest and New England. The state of Vermont has the highest share (7.1%), followed by Montana (6.5%), Colorado (6.5%), and Oregon (6.3%). Louisiana has the lowest share at 2.3%. The reasons behind this geographic distribution are not immediately clear. Potential explanations include the geographic distribution of jobs that are more likely to include or allow at-home employment, weather, age/education differences in the workforce, and less quantifiable differences in workplace culture across states. Regardless, the growth of working-at-home represents a business opportunity for both remodelers and builders to help accommodate homes for this growing purpose. The most recent industry-specific IRS data available (2010) for the home office deduction for independent contractors and sole proprietorships (Form 8829) (not telecommuters) provides a sense of who is using space in their home for a dedicated office. Not surprising, workers in industries that involve more individual independence or technology tend toward greater use of the deduction. For example, educators, the information technology sector, professional services (lawyers, accountants, architects, etc. 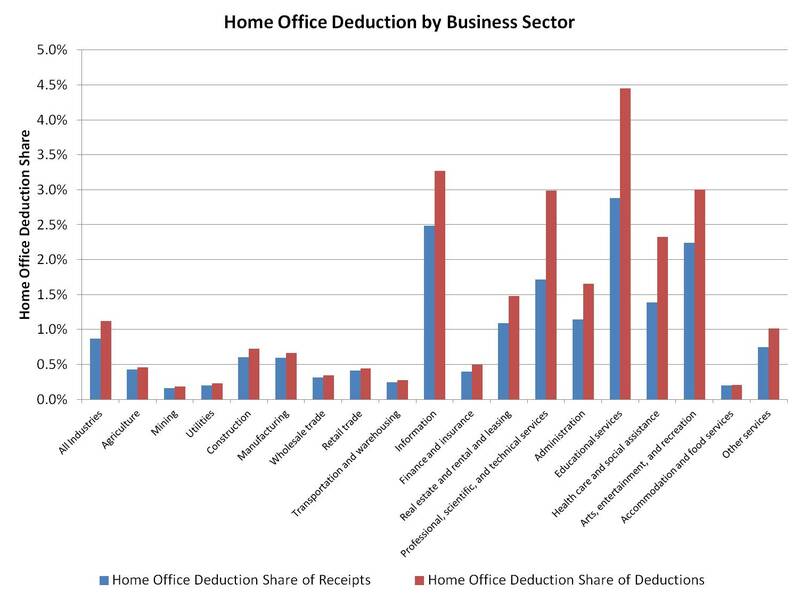 ), and those in the arts and entertainment sectors are all more likely to claim the home office deduction. The real estate sector is in the middle category, with many Realtors reporting home office expenses. Home office deductions are less common in the construction sector, although many small construction firms do have home office expenses. Specific sectors with high levels of home office deduction use include textile producers, electronics producers, nonstore based retailers, publishers, video/audio producers, broadcasters, internet based workers, certain financial workers, real estate brokers, appliance and video rental services, CPAs, architects, engineers, drafters, building inspectors, designers, science and business consultants, advertisers, marketers, business administrators, educators, doctors, social workers, actors, and religious and professional organization workers. Overall, according to IRS data for tax year 2011 $9.8 billion in home office expenses (insurance, rent, repairs and utilities) were claimed on IRS Form 8829. 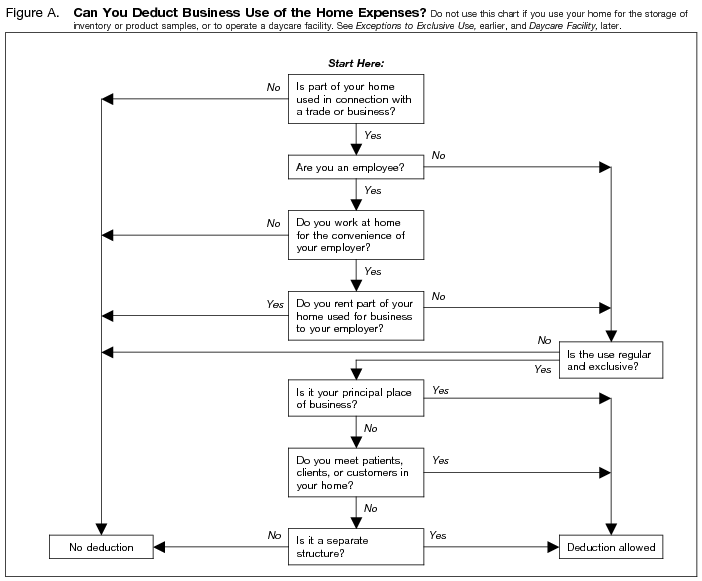 The deduction is split into two classes: direct expenses related to the actual officer and indirect expenses that apply to the home as whole and are only partially deductible. Approximately 6 out of every 7 dollars claimed as a deduction originate from this indirect class. An additional $1.3 billion in home office related depreciation deductions was claimed in 2011. Taxpayers who are likely to claim the deduction, including small business owners (builders and remodelers) and Realtors, should be aware of the rules. The IRS has a good summary page on the deduction. More details can be found in IRS Publication 587, which includes the following useful flowchart regarding qualifying. From a tax law perspective, two key changes are worth noting. First, in 2013 the IRS provided a simplified method for claiming the deduction, which can save taxpayers time in filing the required form. Under this approach, taxpayers may claim a $5 per square foot of home office space (up to a maximum of 300 square feet), other expenses such as mortgage interest and real estate taxes are claimed on Schedule A, and no depreciation deduction (or future recapture) is allowed. Second, for those who have often heard about strict tests connected to the deduction, do keep in mind tax law changes made in 1997 that went into effect in 1999. Under the Taxpayer Relief Act of 1997, a residence can qualify as a principal place of business when it is used to conduct administrative or management activities if there is no other fixed business location. This change clarified a lot of uncertainty regarding the deduction for many classes of workers. However, for all taxpayers (homeowners and renters), the office space must be exclusively used for business purposes. Telecommuting employees are less likely to be able to claim the deduction (they must itemize for example), and should consult IRS Form 2106 for additional detail. In 2005, Congress established a number of energy-efficiency tax incentives related to housing. These policies include the tax code section 45L credit for the construction of energy-efficient homes, the 25C credit for retrofitting existing homes, and the 25D credit for the installation of power production property in new and existing homes. 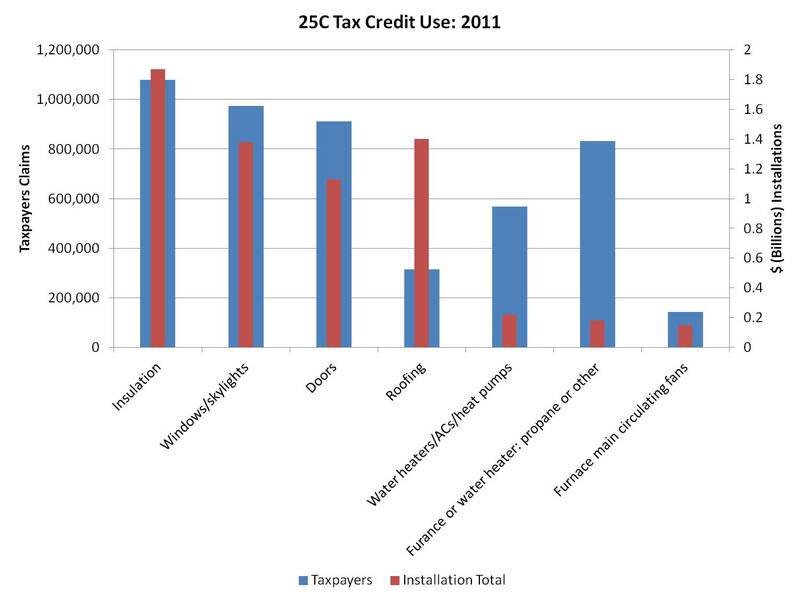 Using earlier IRS data for tax year 2009, we previously examined who benefitted from the 25C and 25D credits, as well as how homeowners used the credits. Last year, we examined the 2010 data for these credits. With the publication of the tax year 2011 IRS data for 25C and 25D, significant reductions in use are clearly seen due to the rule changes that occurred at the end of 2010. For example, from 2009 through the end of 2010, the 25C credit for existing homes was available as a 30% credit and $1,500 limit. After the extension of the “tax extenders” legislation at the end of 2010, those rules were pared back and retained when the credit was extended again as part of the Fiscal Cliff deal. Among those rule changes, the credit was reduced to a 10% rate and a $500 lifetime cap was imposed. It is worth noting that this version of the credit, along with many other tax extenders, expired at the end of 2013. The 2011 IRS data show significant declines in 25C use as a result of the 2010 changes. The largest impact came from energy-efficient windows, for which the total dollar volume of installed qualified property fell from about $7.8 billion to approximately $1.4 billion. Qualified furnace installations declined by more than $5 billion, reaching a 2011 total of about $180 million. 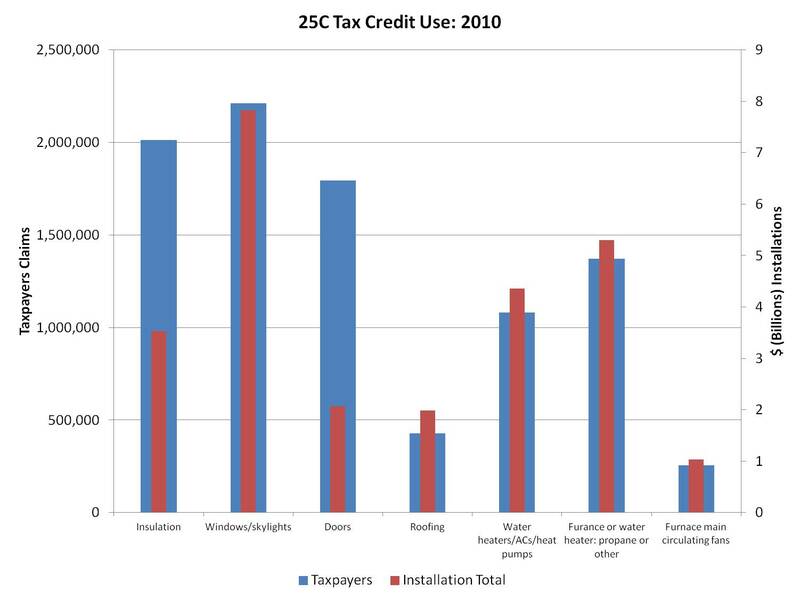 Tax credit qualified insulation installations fell by more than $1.5 billion but was the largest category in 2011 at a total of $1.87 billion. Roofing retrofits were second with a tally of $1.4 billion. In total, more than $6 billion of qualified improvements were made in 2011 in connection with the 25C credit. These expenditures resulted in more than $750 million in tax credits for just shy of 3.5 million homeowners. In contrast, tax credit use under section 25D of the code expanded in 2011 from 2010 levels. The 25D credit is for installation of qualified power production property in both new and existing homes. The credit is equal to 30% of expenditures, including certain labor costs and is claimed by the homeowner. Unlike the 25C credit, the 25D program remains in law and is scheduled to sunset at the end of 2016. The most popular 25D investment in 2011 was the installation of residential solar panels. 25D qualified solar electric property investments totaled almost $1.5 billion in 2011 for more than 100,000 taxpayers. It is worth noting that these solar installations reflect credits claimed for electrical system integrated panels that provide power for the home, as well as panels used to power stand-alone property like attic fans. The second largest category was geothermal heat pumps, with $1.2 billion of installations claimed by more than 70,000 homeowners. 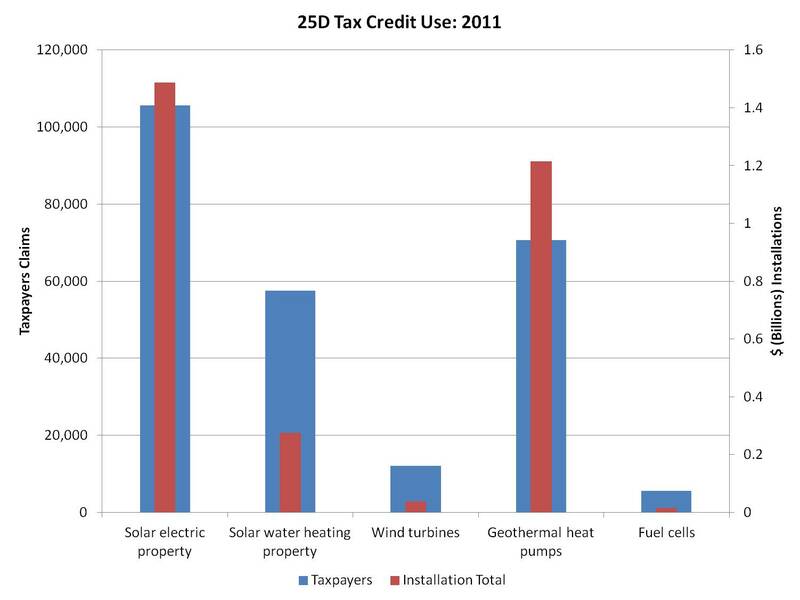 The geothermal category experienced the largest growth in 2011 in terms of tax credit claims, up almost $300 million in total installations over 2010 totals. In total, for 2011 there were $3.03 billion of qualified power production investments yielding about $921 million in 25D credits. Given the rising popularity of items like solar panels, builders are well advised to examine the 25D program for prospective homeowners. The 25D credit can be awarded in new construction by providing the eventual homeowner an itemized breakout of material and labor costs associated with qualified property installation, so that the homeowner can claim the credit on their income tax return. An IRS Q&A on 25D and 25C can be found here. Tax policy plays a key role in shaping housing demand, determining business conditions and deterring or fostering economic growth. Housing-related tax policy is of such significant importance that it has been selected as a primary issue for NAHB’s 2014 legislative conference, “Bringing Housing Home,” which takes place March 17-21 as home builders and other members of the residential construction industry meet federal lawmakers. As part of this event, yesterday we examined labor issues and tomorrow we will look at the future of the housing finance system. The mortgage interest deduction (MID) is a cornerstone of housing tax policy. Deductions for mortgage interest have been permitted since the establishment of the income tax in 1913. Broadly claimed, the deduction facilitates homeownership by reducing the after-tax of purchasing a home with a mortgage. The MID also creates parity with other forms of investment for which interest expense is deductible. Historically more than 85% of mortgage interest paid is claimed as a deduction on Schedule A. That is, most people paying a mortgage are in fact itemizing taxpayers. And the largest benefits as a share of household income, are typically for younger households, who are paying mostly interest in the early years of a mortgage. The rules for second homes are also critically important for homeowners who change principal residences within a tax year, traditional seasonal residence markets, and custom home construction in which the eventual homeowner takes out a construction loan. 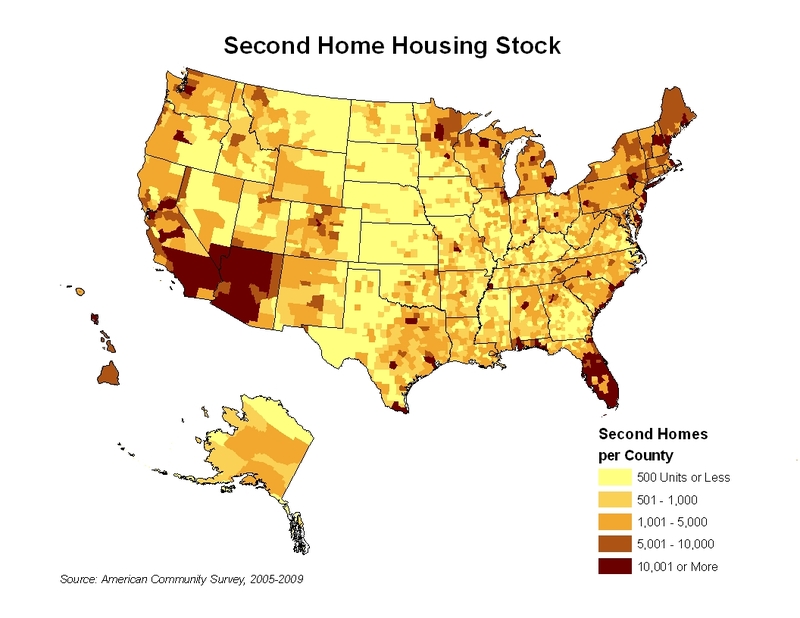 This broad use of the second home MID rules is illustrated by examining the geographic distribution of the second home housing stock. Public opinion polling consistently reports that homeowners and renters – prospective homebuyers – favor retaining present law rules concerning the MID and defending our nation’s commitment to homeownership. For example, a 2013 United Technologies/National Journal Congressional Connection Poll asked respondents to rate the importance of various tax rules. The results indicated that 61% of respondents said that it was ”very important” to keep the MID, with 86% of individuals saying it was either “very important” or “important.” This placed the MID second in their list, falling behind only tax preferred retirement accounts, such as 401(k)s, which scored a 63% “very important” ranking. 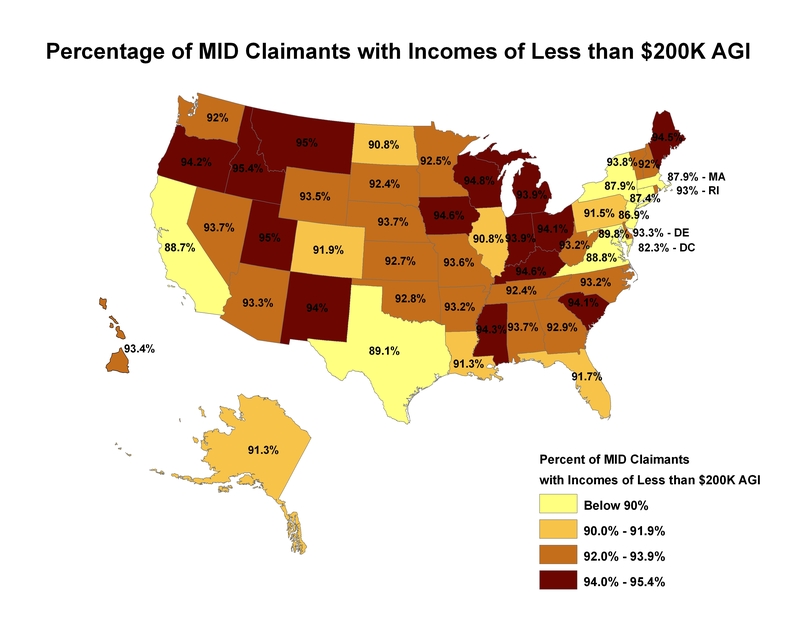 Recent economic research has linked the use of the MID with intergenerational income mobility. And macroeconomic modeling by the Tax Foundation found that repealing the MID to lower-income tax rates would reduce GDP growth. Another important tax program on the rental housing side of the industry is the affordable housing credit or LIHTC. Created as part of the last major tax reform effort in 1986, the Low-Income Housing Tax Credit (LIHTC) replaced previous policies with a successful private-public partnership that ensures the development of housing for low- and moderate-income Americans. Since its inception, the program has financed the construction of more than 2.5 million affordable homes. The LIHTC allows equity investments to be raised at lower cost, which makes the production of affordable housing possible. The LIHTC sustains 95,000 new full time jobs per year across all U.S. industries—generating $2 billion in federal tax revenue. No other housing program has been as successful as the LIHTC in producing safe, high quality, affordable rental housing. 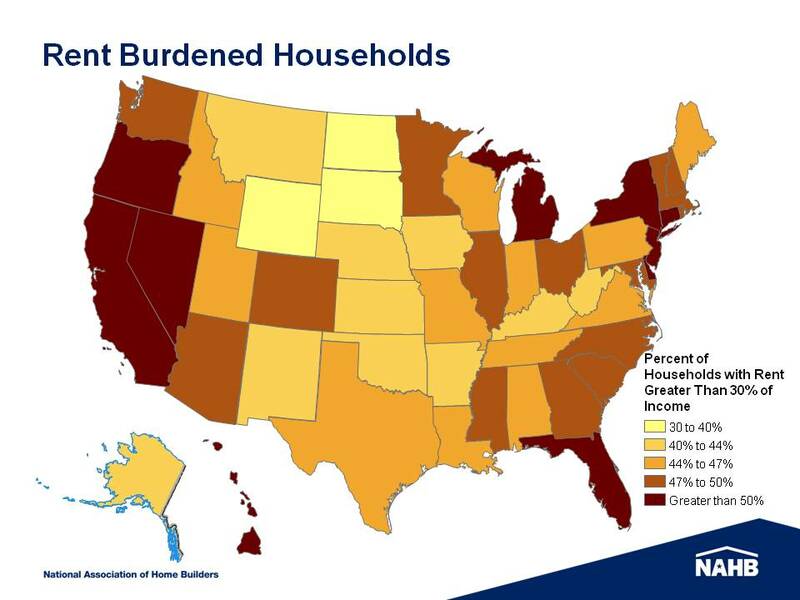 While the program has been producing approximately 75,000 new homes a year, the need for affordable housing remains strong given rent burden levels across the nation. For these reasons noted above, the future of the MID, the LIHTC, and other housing related tax provisions should be watched carefully in any future tax reform effort. A recent discussion draft of a comprehensive tax reform proposal from House Ways and Means Chairman Dave Camp would, for example, make significant changes to these and other tax rules. Chairman Dave Camp of the House Ways and Means Committee published a discussion draft of a comprehensive tax reform proposal on February 26th. The 979 page legislative draft adopts the policy strategy of broadening the tax base, while lowering income tax rates. These changes are approximately revenue neutral according to the Joint Committee on Taxation. In practice, this approach means the elimination or modification of many deductions, credits, exemptions, exclusions and other rules in exchange for lower income tax rates. While there is approximately no net revenue change for the government and little change for average taxes paid by all income classes of taxpayers, there are many winners and losers within those classes in terms of changes in tax liability due to the many changes involved in the proposed reform. NAHB is examining the proposal in its entirety to evaluate its impact on the housing industry, including home builders, multifamily developers, remodelers, and homeowners and homebuyers. Some changes represent negatives for housing, while others may offer benefits. What follows is list of proposed changes to existing federal tax law that should be of interest to the greater housing and real estate industry. In the weeks ahead, we will quantify the impacts of many of these changes as part of an effort to evaluate the economic impact of the draft. For example, our next post on this tax reform draft will examine the dynamic (macroeconomic) analysis produced by the Congressional Joint Committee on Taxation, which indicates the impact of this comprehensive tax reform proposal on jobs, GDP, and the business capital stock. The existing tax rate system would be replaced with, effectively, a three tier tax rate system: 10%, 25% (beginning at $71,200 for joint returns), and 35%, which is made up of the 25% rate and a 10% surtax on AGI amounts in excess of $450,000 ($400,000 for single returns). The 10% rate is phased out for AGI in excess of $300,000 ($250,000 for single returns). The additional 10% surtax would allow deductions for the calculation of that excess for a number of items including charitable deductions for itemizers and “qualified domestic manufacturing income,” which includes receipts derived from construction of real property. This definition does not, however, include receipts from residential rental activity. It is important to keep in mind that individual income tax rates are business tax rates for pass thru entities, such as S Corps and LLCs, which make up most real estate related businesses. Capital gain and dividend income would be subject to ordinary income tax rates, although allowed an above-the-line deduction equal to 40 percent of that income. As the 3.8% net investment income tax remains in place in the draft, with the 40% exclusion, the top capital gains tax rate would be 24.8%. Future tax bracket dollar thresholds would be determined by chained CPI, rather than CPI-U as under present law. This would reduce the inflation adjustments and lead to lower bracket thresholds in the future relative to present law. The individual Alternative Minimum Tax is repealed. To claim the mortgage interest deduction, taxpayers must itemize – that is, have total Schedule A deductions in excess of the standard deduction. The draft proposal would raise the standard deduction significantly to $22,000 ($11,000 for single taxpayers). However, the standard deduction is phased out for taxpayer’s with AGI in excess of $513,600 ($356,800 for singles). Such taxpayers would also have their itemized deductions phased out. This phaseout would replace the present law Pease phaseout of itemized deductions, which acts as a marginal tax rate increase. More fundamentally, the significant increase in the standard deduction amount would reduce the number of taxpayers who itemize from 30% to approximately 5%. Due to other proposed changes, the mortgage interest deduction and the charitable deduction, which itself is proposed to be subject to a 2% AGI floor to claim the deduction in the draft, would effectively be the only remaining itemized deductions allowed for most taxpayers. For homeowners to itemize, these two sources would need to sum to an amount greater than the standard deduction. For 2014, taxpayers may claim personal exemptions for members of their household in the amount of $3,950 per qualified person. These exemptions would be repealed and replaced by the larger standard deduction. The child tax credit increases from $1,000 to $1,500, in part to make up for the loss of the personal exemptions for qualified children. The present law $1 million principal cap for a first and a second home is reduced over four years to a new cap of $500,000 (not indexed to inflation). The new cap would not apply to existing mortgages, just new purchases. Refinancings of existing mortgages would be governed by the $1 million cap, provided the refinancing did not increase the amount of principal owed. Home equity interest deductions are disallowed, although home improvement loans would continue to qualify as acquisition indebtedness, similar to present law AMT rules. Additional IRS reporting requirements would apply, including the amount of outstanding principal and the date of origination. The deduction for property taxes paid on owner-occupied homes would be eliminated, along with other state and local income, sales, and personal property tax deductions. For the purposes of the $500,000/$250,000 gain exclusion for the sale of principal residence, the draft extends the ownership and use period test, from two years out of five (as under present law) to five years out of eight. The exclusion can only be used once every five years. And finally, the exclusion is phased out by income dollar for dollar for AGI in excess of $500,000 ($250,000 if single). The proposal would retain the sunset or eliminate all housing related energy efficiency tax credits, including the section 25C energy-efficient remodeling credit, the 25D residential power credit (for solar, wind turbines, etc, which expires at the end of 2016), the 45L $2,000 new energy-efficient home tax credit, and the 179D commercial and multifamily retrofit deduction. Under the proposal, self employment income for FICA taxes would now include an S Corporation shareholder’s (or partnership equivalent) pro rata share of income. Individuals with no material participation would continue to exclude the income from self employment tax, with participation defined by similar rules as the tax code’s passive loss rules. All other shareholders could claim a deduction equal to a share of the income, with the share determined by the lesser of 30% of the sum of the relevant pass thru income and wages from the S Corporation or pass-thru net earnings from self employment. This share is intended to capture the historical portion of U.S. GDP due to non-labor income. The above-the-line deduction for moving expenses, when relocating for a new job, is repealed. The ability to withdrawal some funds from a tax preferred retirement account for a first-time home purchase is repealed. The legislative draft retains the LIHTC, but makes several changes to the affordable housing credit. Credits will now be allocated by cost basis, rather than credits as under present law. Next, the 130% basis boost option is repealed. The national unused housing credit pool would be repealed. A significant change involves extending the 10 year credit claim period to 15 years, which will reduce syndicated credit prices. However, the 70% present value formulation is adjusted to remain 70% over the 15 year period. The draft repeals the 30% present value credit (the 4% credit). The nonrecognition of capital gain due to like kind exchanges is repealed for all transactions, with the exception of certain binding contracts entered into during 2014. The legislative draft eliminates the tax exemption for PABs, including multifamily rental bonds and mortgage revenue bonds. The draft also eliminates the mortgage credit certificate option. The proposal lowers the C Corp tax rate to 25% after tax year 2018. The lower rate is phased in between 2014 and 2018. The proposal requires treating certain capital gain income due to a carried or promoted interest as ordinary income for tax purposes. However, capital gain income due to a carried interest associated with real estate (i.e. section 1231 property) retains its character as a capital gain. All contributions of capital are included in gross income, other than contributions of money or property for exchange of stock or interest in an entity. Under present law, contributions in aid of construction are taxable, with the exception of certain water and sewer items. Under the proposal all such contributions would become taxable. Residential rental real estate is subject to a 27.5-year depreciation life. The proposal would extend the depreciation period for newly developed real property to 40 years. An inflation adjustment would be allowed, that would increase depreciation deductions somewhat. The Treasury Department would be instructed to develop depreciation periods for other forms of tangible property. The tax code’s long term accounting rules require use of the percentage of completion method of tax accounting for contracts lasting more than one tax year. A notable exception to this rule is the home construction contract rule, which the home building industry obtained after the 1986 reform effort to prevent builders from having to finance tax payments as part of the development process. The draft repeals this exception, but leaves in place the small construction contract exception for businesses with gross receipts of less than $10 million (three year average, not indexed for inflation). Under the draft, 50% of advertising expenses must be capitalized and thus no longer available for immediate write off. The capitalized expense would be amortized over a ten year period. Taxpayers with less than $1 million in advertising in a given tax year would be exempt from the capitalization requirement. Section 179 small business expensing would be made permanent for a maximum of $250,000, which is reduced by the amount that the qualified property investment exceeds $800,000. Both amounts are indexed to inflation. Installment tax accounting is permitted for certain dealer dispositions of timeshares and residential lots under present law. The legislative draft repeals these exceptions to the more general prohibition against installment sale accounting to report gains income. The rule allowing brownfield expenses to be expensed would be repealed, although over a number of years. Under the proposal, a taxpayer must recapture the gain on disposition of section 1250 property as ordinary income to the extent of earlier depreciation deductions taken. Recapture of depreciation attributable to periods before January 1, 2015, is limited to the depreciation adjustments only to the extent that they exceed the depreciation that would have been available under the straight-line method. The tax credit for historic rehabilitation of rental properties is repealed. The draft expands the exception to the uniform capitalization rules for certain small taxpayers. Any business that produces or acquires real or tangible property with average annual gross receipts of less than $10 million is not subject to the UNICAP rules under the proposal. The proposal provides a safe harbor under which if certain requirements are met. These include a written contract and certain tax withholding. The legislative draft gradually phases out the existing deduction for domestic economic activity, including construction, with final repeal in tax year 2017. The existing deduction is equal to nine percent of qualified income. With the government shutdown/debt ceiling conflict resolved, at least for the next few months, it is a good time to revisit the policy debate that preceded it – the fiscal cliff. In January, a number of real estate related tax provisions were extended for another year. At the end of 2013, these provisions are set to sunset. And for now, there appears to be little likelihood of a “tax extenders” bill being enacted before the end of the year. Mortgage debt forgiveness tax relief: rule that prevents tax liability arising from many short sales or mitigation workouts involving forgiven, deferred or canceled mortgage debt. Deduction for mortgage insurance: reduces the after-tax cost of buying a home when paying PMI or insurance for an FHA or VA-insured mortgage; $110,000 AGI phase-out. The section 25C energy-efficient tax credit for existing homes: remodeling market incentive with a lifetime cap of $500. The section 45L new energy-efficient home tax credit: allows a $2,000 tax credit for the construction of for-sale and for-lease energy-efficient homes in buildings with fewer than three floors above grade. The 9% LIHTC credit rate: absent the credit fix, the LIHTC program would suffer a loss of equity investment for affordable housing projects; in place for 2013 allocations. Base housing allowance rules for affordable housing: income definition rules. The section 179 small business expensing limits: offers cash flow and administrative cost benefits for small firms, with limits of $500,000 for deductions and $2 million for capital purchases. The section 179D deduction: provides a deduction for some energy-efficient upgrades to multifamily and commercial properties. New Markets Tax Credit: no new allocations of this community development tax credit. At this time, it would be prudent for homeowners and housing stakeholders to assume that all of these tax provisions will sunset at the end of 2013. If these rules are extended, it will almost certainly occur retroactively through legislation passed later in 2014. And of course, comprehensive tax reform could change all tax rules substantially. Finally, while not expiring at the end of 2013, it is worth noting that the section 25D 30% credit for installation of solar, wind, fuel cell, or geothermal residential power production property expires at the end of 2016. This credit can be used in connection with both remodeling and new construction and is claimed by the homeowner. 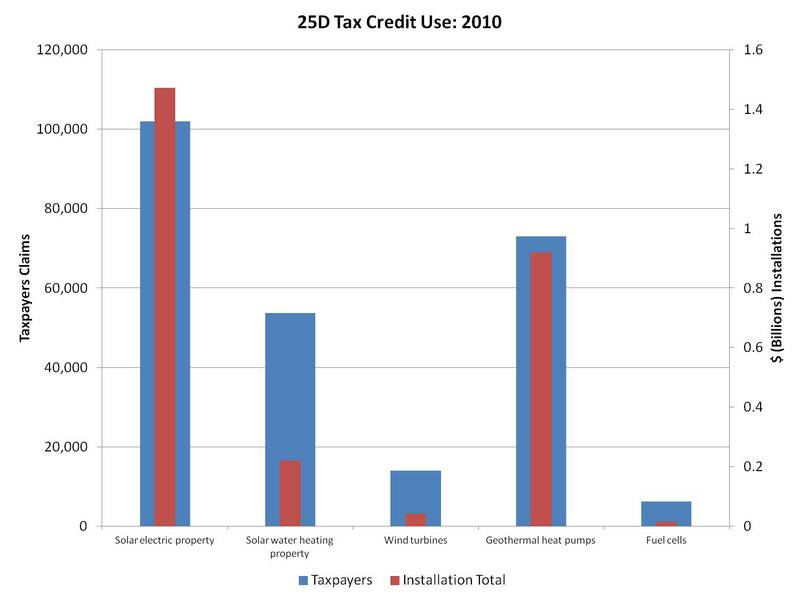 How Did Homeowners Use the Energy Tax Credits? Using earlier IRS data for tax year 2009, we previously examined who benefitted from these credits, as well as how homeowners used the credits. Newer 2010 data also allow exploring these energy related investments. The 25C credit is only available for existing homes. In 2010, the rules were more favorable than today, with a 30% credit and $1,500 limit. Those rules have since been pared back during successive extension efforts. The current form of the credit expires at the end of 2013. The IRS data indicate that in terms of dollars, energy-efficient windows were the most popular investment, totaling more than $7.8 billion of spending by more than 2.2 million homeowners. Energy efficient natural gas, propane, and oil powered water heaters and furnaces were second, with $5.3 billion in qualified expenditures by almost 1.4 million taxpayers. In total, more than $26 billion of qualified improvements were made in 2010 in connection with the 25C credit. These expenditures resulted in more than $5.4 billion in tax credits for just shy of 7 million homeowners. The 25D credit is for installation of qualified power production property in both new and existing homes. The credit is equal to 30% of expenditures, including certain labor costs. And unlike the 25C credit, the 25D program is currently set to expire years from now – at the end of 2016. The most popular 25D investment in 2010 was the installation of solar panels. 25D qualified solar electric property investments totaled almost $1.5 billion in 2010 for more than 100,000 taxpayers. The second largest category was geothermal heat pumps, with $920 million of installations claimed by almost 73,000 homeowners. In total, for 2010 there was $2.67 billion of qualified power production investments yielding about $800 million in 25D credits. Given the rising popularity of items like solar panels, builders are well advised to examine the 25D program for prospective homeowners. The mortgage interest deduction (MID) is linked positively with intergenerational mobility – a measure of economic opportunity – according to new academic research from economists at Harvard and Berkeley. This paper comes on the heels of separate research showing that trading the MID for lower individual income tax rates results in lower economic growth. Using matched tax panel data, the team of economists examined the impact certain tax policies had on differences between the income percentile of children (born in 1980 or 1981 and now adults in the labor market) and the income percentile of their parents when those parents were young workers in the labor force. Differences in income rankings between parents and now adult children are indicative of intergenerational mobility. In contrast, high correlation between parents’ rankings and adult children’s rankings suggest low mobility and less dynamism and economic opportunity. The tax policies examined include a measure of progressivity of tax expenditures, as well as specific policies including the MID, the state income tax deduction, and state-level earned income tax credits. These deductions may impact economic opportunity by providing opportunities for credit-constrained middle and low income families to become homeowners. Mortgage interest deductions are also positively related to intergenerational mobility. In sum, there is some evidence that CZs (commuting zones) with larger mortgage interest deductions as a fraction of AGI are more economically mobile. …we find evidence that the tax expenditure components of mortgage interest deductions, state income taxes, and state EITCs each have individually positive effects on intergenerational mobility. The progressivity of overall tax expenditures and state income taxes also have a robust, significant relationship with higher intergenerational mobility. Overall, these results suggest that tax expenditures aimed at low-income taxpayers can have significant impacts on economic opportunity. Hence, the short-term fiscal gains from reducing such expenditures must be weighed against the potentially large long-term costs of reduced income growth for low income individuals. The research is generally consistent with data and analysis assembled by NAHB examining the beneficiaries of the MID. Among our findings, we have noted the importance of the housing tax incentives for younger homebuyers, aged 44 and below, who tend to be more credit constrained and are thus paying greater amounts of mortgage interest as a share of adjusted gross income (AGI). By reducing the after-tax cost of buying a home with a mortgage, the MID facilitates homeownership for a broader base of households and reduces the age of a typical first-time homebuyer. Eliminating the MID would increase the cost of buying a home with a mortgage for most homebuyers, delaying or deferring homeownership for such households. By reducing housing demand, prices would fall, thereby imposing a windfall wealth loss for existing homeowners. Cash buyers would benefit, but because the MID is not entirely capitalized into prices, buyers using a mortgage to finance their purchase are worse off as the after-tax cost of debt increases more than prices fall. The NAHB research conclusions are reinforced by the academic paper cited above, which provides evidence that communities with taxpayers claiming larger MIDs as a share of AGI produce more economic opportunity by increasing the affordability of homeownership. The MID thus facilitates homeownership and economic mobility.